Ooh, this is something unexpected. That Incredible phone that's been knocking around for months now will be part of the Droid line-up, launching with Verizon Wireless on April 29th. They haven't announced full spec just yet for the phone, but thanks to yesterday's leak we know all of that anyway. 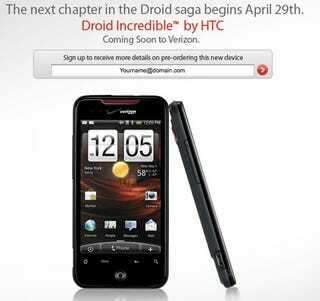 The Android phone will run 2.1 with HTC Sense, and will have an 8MP camera and Snapdragon processor. Definitely worth getting excited over.